In 6-quart or larger saucepan, heat 4 quarts water to boiling over medium heat. Meanwhile, in 2-quart microwavable bowl, mix potatoes, milk and melted butter. Cover; microwave on High 4 to 6 minutes or until steaming. Uncover; let stand 2 minutes. Stir in egg. Stir in 1 cup of the flour and the baking powder. Spread 1 cup of the flour on work surface. Place remaining 1/4 cup flour in medium bowl. Transfer dough to work surface; knead to incorporate flour. Continue to knead 3 to 4 minutes longer or until dough is smooth. Divide dough into 4 pieces. Shape one piece into smooth ball, then shape to form 3/4-inch diameter log. Using knife, cut 1/2-inch pieces of dough; transfer to bowl of flour, and shake bowl to coat gnocchi in flour. Repeat with remaining 3 pieces of dough. Thoroughly toss to coat all gnocchi in flour. Meanwhile, in 4-quart saucepan, heat whipping cream just to boiling over medium heat. Remove from heat; stir in Parmesan cheese and salt. Stir in lemon juice. Add gnocchi to boiling water; return to boiling. Once gnocchi begin to float, reduce heat to simmering; cook 2 minutes. Using slotted spoon, transfer to mixture in saucepan; toss to coat. Stir in herbs. When kneading in the flour, be patient. It may seem like a lot of flour to add, but the dough will absorb all of it as you knead. Don’t feel like making sauce? Jarred Alfredo sauce will work in a pinch. Gnocchi is an Italian dumpling made from potatoes or flour and is typically served with some type of sauce. The type of sauce that’s considered “traditional” varies depending on region and location. But you can (and should!) use whichever sauce suits your personal preference. Traditionally in Italy, gnocchi sauce is comprised of a butter or olive oil-based sauce mixed with herbs. Other options include a red, tomato-based sauce or a white creamy béchamel sauce. 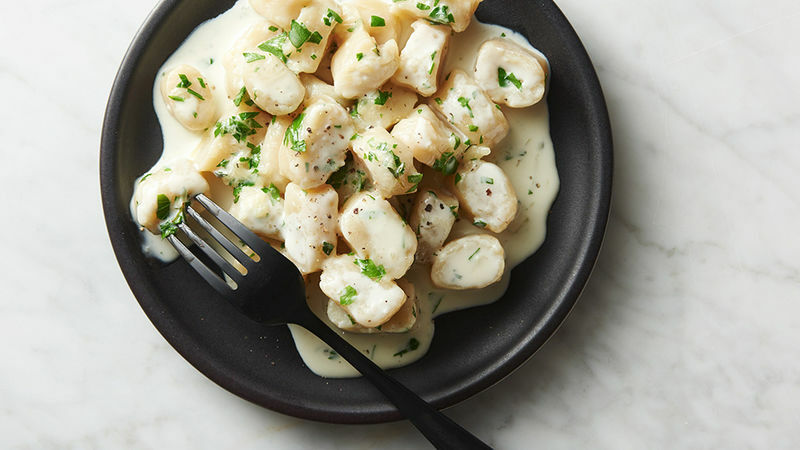 This recipe has its own twist for gnocchi sauce using heavy whipping cream, Parmesan cheese and a few seasonings making it cheesy, creamy and rich—just the way we like our pasta dishes!